The 30-year-old man who garnered national attention for his refusal to move out of his parents' home has spoken out to detail his troubles with his folks. 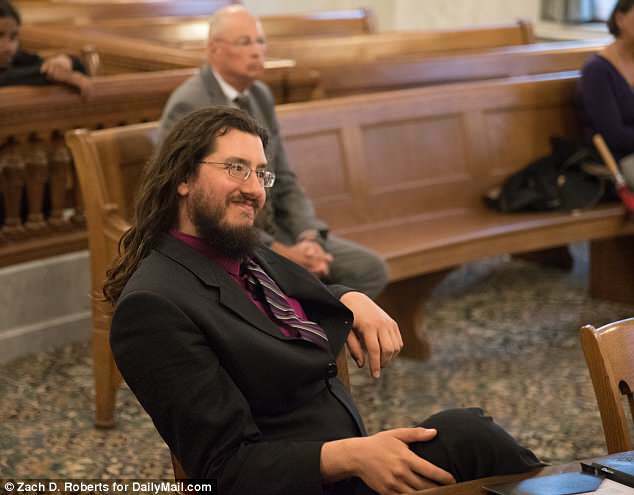 On Tuesday, a judge ordered Michael Rotondo to move out of his parents' home in Camillus, New York, where he has been living rent-free for nearly a decade. 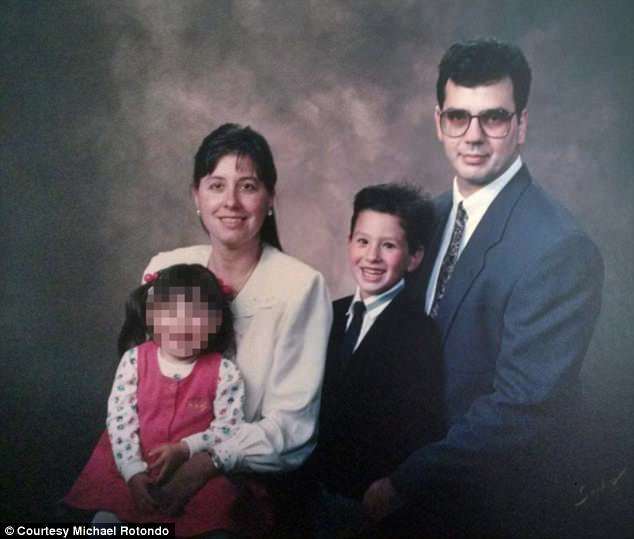 In an interview with DailyMail.com after the hearing, Michael said that his issues with his parents, Mark and Christina, are tied to his custody battle over his son. Michael says he lost custody of his son, whose age he wouldn't disclose, back in September. The boy now lives with his mother full time, who Michael says he was never married to, or in a relationship with. He says he immediately filed an appeal as a 'poor person' so that his court fees could be waived going forward. But he says his parents complicated matters when they said he needed a job and health insurance if he was to continue living with them. Michael refused, saying that his job at the moment was getting his son back. When they offered to pay for his health insurance, Michael explained that he couldn't take that money because it would compromise getting the 'poor person' status. 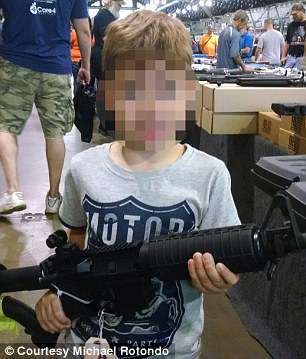 Shortly after, he says his parents stopped providing food for him, and cut off his cellphone. They also said he couldn't use the laundry machines in the house anymore. His parents also went to court to try to get visitation of their grandchild. Michael says it was two days after that hearing that he got his first letter, in which his parents said they had 'decided that you must leave this house immediately'. The went on to send him four more letters, but Michael refused to budge. Michael says he hasn't always lived at home. 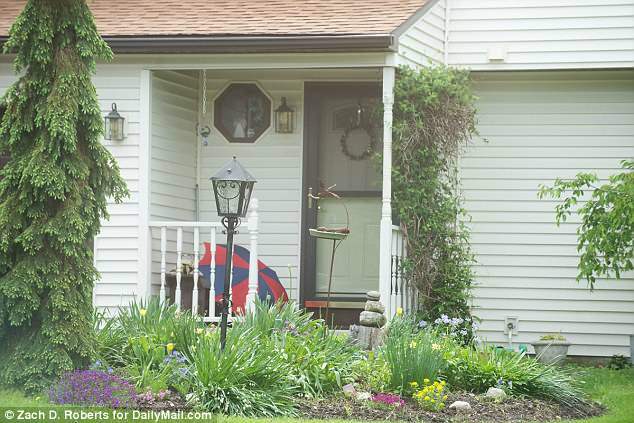 He says about eight years ago he lived in an apartment for a year and a half. He says it was around that time that he became a father. When asked where he was working at the time, Michael said he didn't 'want to disclose' his work history. 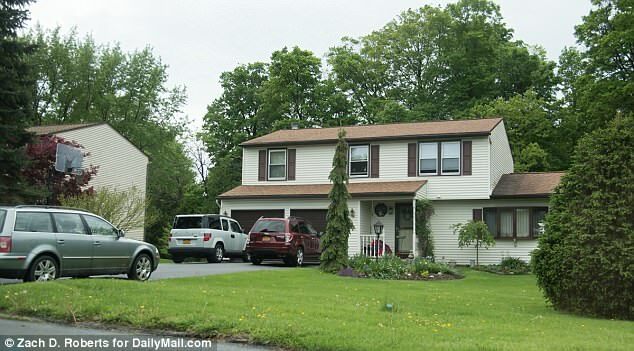 DailyMail.com did discovered that he used to work at a Best Buy, and that he is suing the company for discrimination, saying he was fired when he said he couldn't work Saturdays since that is when he had visitation with his child. He is seeking nearly $340,000 in damages, pay and attorney's fees from the big box store. He said he went to college, but didn't finish his degree. He started off studying engineering at Onondaga Community College, but switched to business when he 'couldn't hack the math'. Michael also wouldn't go into detail about how he lost custody of his son, but insists he is a 'great father' and that the court ruling was 'unreasonable'. The judge in that case said he could see his son, but only in therapeutic environments. And the boy's mother has to approve. Michael said he doesn't think his son is 'better off in any way' over the decision. 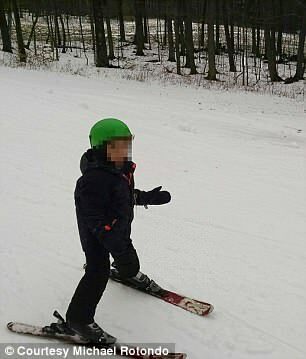 DailyMail.com tried to reach out to Michael's parents on Tuesday, but whoever was at the home hung up the call. 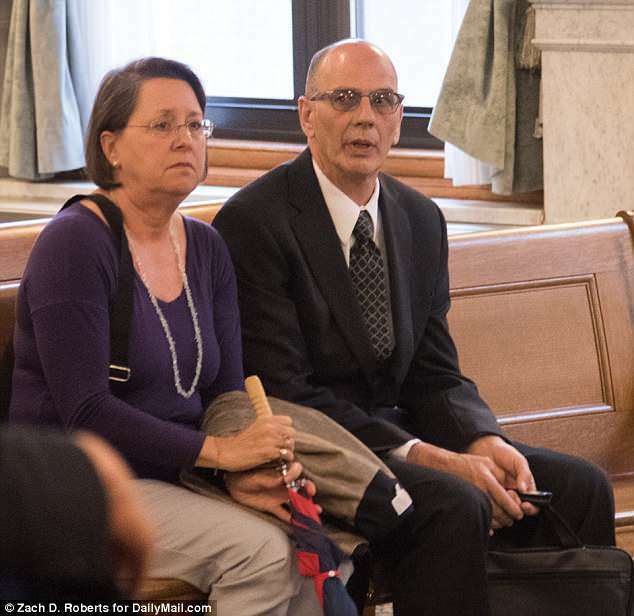 In court on Tuesday, Michael argued that there was a legal precedent that his parents had to give him six months notice in order to kick him our. The judge said that precedent had been overturned in another case, and said six months was an 'outrageous' amount of time to ask for. Michael responded that it was 'outrageous' to evict him. The judge also ordered adult protective services to investigate. Michael left court frustrated, refusing to speak to his parents and saying he didn't think the judge read the case fully, according to CNY Central. 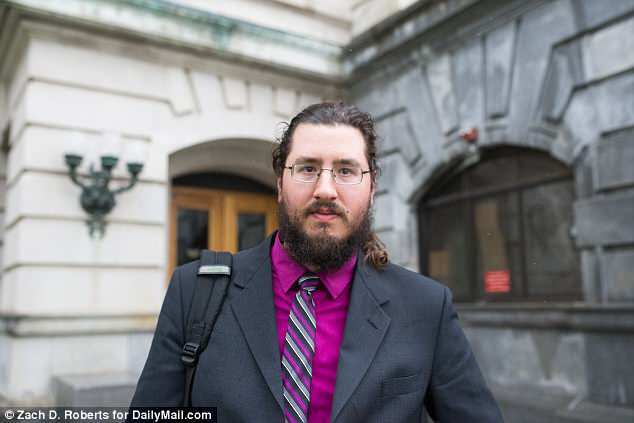 'I am just so outraged,' he said outside court, adding that he has been taunted by conservative groups for being a 'liberal millennial'. It was not decided in court on Tuesday when Michael must be out of the house. But he says he plans to appeal, so any enforceable order likely won't be written until that case is over. 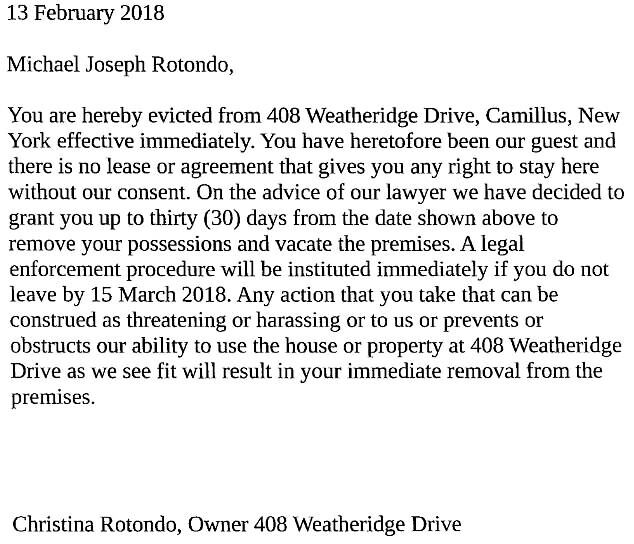 Over the past three months, the Rotondos have given their son five written notices to move out, but he has ignored their orders. 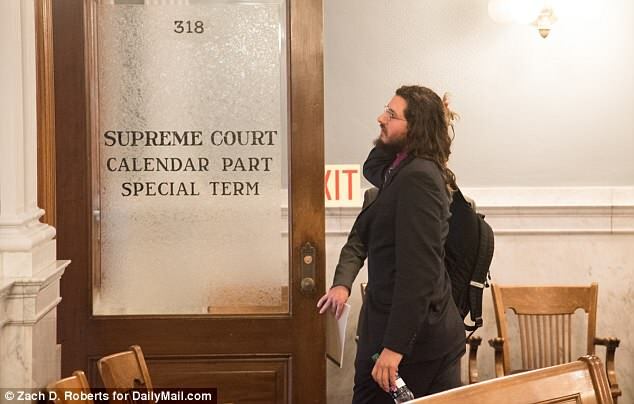 In a response to his parents' court filings, Michael - who turns 31 in July and is acting as his own lawyer - says his parents have not given him a reason why he is being kicked out, or enough time to find a new place. He claims in his response that in the eight years he has lived with his parents, he 'has never been expected to contribute to household expenses, or assisted with chores and the maintenance of the premises, and claims that this is simply a component of his living agreement'. In a redacted filing, Michael also said he runs his own 'successful' business, calling it 'the overwhelmingly superior choice for the economic well being over the working of a full-time job'. His father wrote that 'after a discussion with your Mother, we have decided that you must leave this house immediately'. They gave him 14 days to vacate, saying he 'will not be allowed to return'. 'We will take whatever actions are necessary to enforce this decision,' the letter read. When he had not moved out two weeks later, his parents followed up with another letter, telling him he had been 'evicted'. 'You have heretofore been our guest and there is no lease or agreement that gives you any right to stay here without our consent,' they wrote. They then gave up another 30 days to leave. 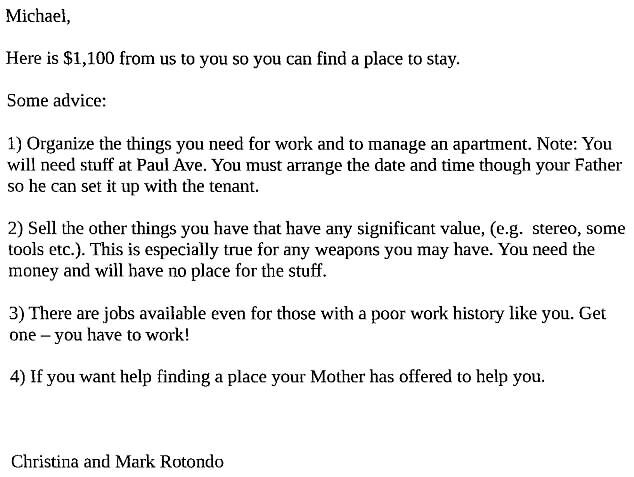 The couple wrote a third letter five days later, offering Michael $1,100 to find a new place to stay and some advice on how to get a new apartment - such as selling 'any weapons you may have' for rent money (he later said he took that money and used it for expenses). 'There are jobs available even for those with a poor work history like you. Get one-- you have to work! 'If you want help finding a place your Mother has offered to help you,' the letter reads. On March 5, the couple wrote a fourth letter saying they 'have seen no indication that you are preparing to leave'. 'Be aware that we will take any appropriate actions necessary to make sure you leave the house as demanded,' they wrote. Their most recent letter was written on March 30, concerns Michael's car, offering him money to fix it so that it can be taken off their property. 'I feel bad for both of them, because he’s not learning anything by staying at home and he’s just wasting their time and money,' one neighbor said, according to WRAL. In a separate case, he claimed his rights to due process were violated in family court, but that case was thrown out in November of last year.